Hotel Bonifacio, Florence. Bonifacio Hotel Florence. Are you planning a business or pleasure trip to Florence? The Hotel Bonifacio is the perfect choice for you. Modern, comfortable, characterized by warm and gentle welcoming, the hotel will make you feel like in your own home, surrounded by every comfort, with a big offer of services and amenities. At a few steps from the heart of the city, Duomo, Congress Centre, da Basso Fortress, Railway Station, easily reachable with every mean of transport, the hotel was very famous also in 1950 because it was an original structure, today it has preserved during the time its reputation of welcoming hotel with a unique offer. In addition to the rooms, 19 in total, which are provided with every modern comfort (telephone, satellite TV, mini bar and air conditioning) and Meeting Room perfect for your meetings, business meeting with numerous people, as well as in order to spend a relaxing moment with a book or a newspaper; the hotel offers a splendid breakfast room, with a little bar, while during the hot months, there is the possibility of having breakfast in the garden. Start your day with the right energy, thanks to our fresh products of the Italian tradition with also a wide choice of cheese, fruit and jam. 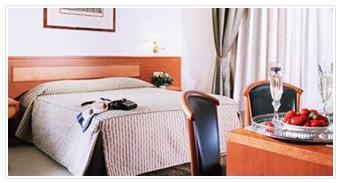 The Hotel Bonifacio represents the traditional hospitality in the heart of Florence.